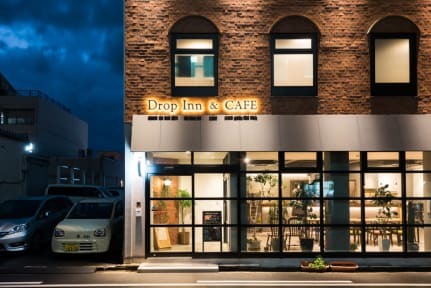 Drop Inn Tottori is situated in the centre of Tottori city, only a 3-minute walk from Tottori Station and a 1-minute walk from Tottori Station Bus Terminal. Tottori Airport is a 15-minute drive, while the Tottori Sand Dune is a 15-minute drive from the hotel. The accommodation boasts dormitory rooms that come equipped with single beds and storage space, a safety box and TV. Guests will also find power sockets and USB sockets, as well as small shelves and clothes hangers for their convenience. All rooms are locked automatically, and guests can enter their rooms with card keys. Every floor features 2 toilets, 2 shower rooms and a powder room. The female only floor features 2 toilets, 2 shower rooms and a female only power room. Laundry machines can be found on the 2nd and 4th floors. Free bath amenities such as makeup removers, cotton pads, hair dryers and hair straighteners are provided. Great location, a few minutes away from Tottori station. The staff are very friendly and helpful. They were able to arrange sandboarding and paragliding the day before. The facility is clean. I would stay here again if I visit Tottori. The hostel was sooo gooodd. THE BEST I have ever seen. The staff was soo helpful. I wanna go back. NIce hostel and bed. Towels changed daily, very nice. Close to the train and bus station which is a good start to travel in Tottori. Staff were wonderful and friendly. Love this place. The locals are very nice and welcoming. Easily the best hostel I've been to since arriving in Japan. Great spacious capsule. They make your bed for you. Free towels. Free breakfast (it's pretty average though). Laundry is a washer and dryer all in one machine. 2 lockers with enough space to fit all luggage. Really nice helpful staff. Very close to the train station. Very cozy place with nice staff. Drop Inn Tottori doesn’t look like a simple hostel compared with the others I have stayed. 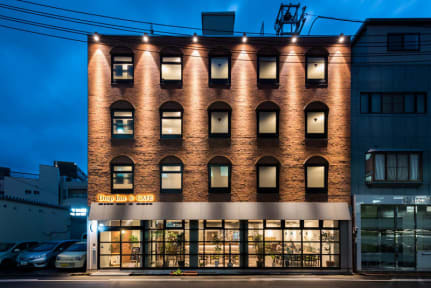 The location is quite convenient just few minutes walk from the JR station. The place is quite peaceful and cleanliness. I didn’t expect that tv would be installed mounting on the wall inside each dorm and bed is comfortable. My friends and I enjoyed staying here so much. I definitely come back and highly recommend to anyone who are planning on traveling to Tottori. Value for money. It's really good location beside Tottori station. And it was clean and simple. It was a small space but there were everything - blanket, locker, charging code, television etc. It was enough to stay a night. I'd recommend the people because it's location is insanely good. 2-3 min walk from the main train and bus station. Small free breakfast and nice staff. It isn't a hostel as per say so there isn't really anyone who interacts with anybody. But it's good and clean, I'd return should I go back to Tottori.